Pier 39 is a shopping center and popular tourist attraction built on a pier in San Francisco, California. 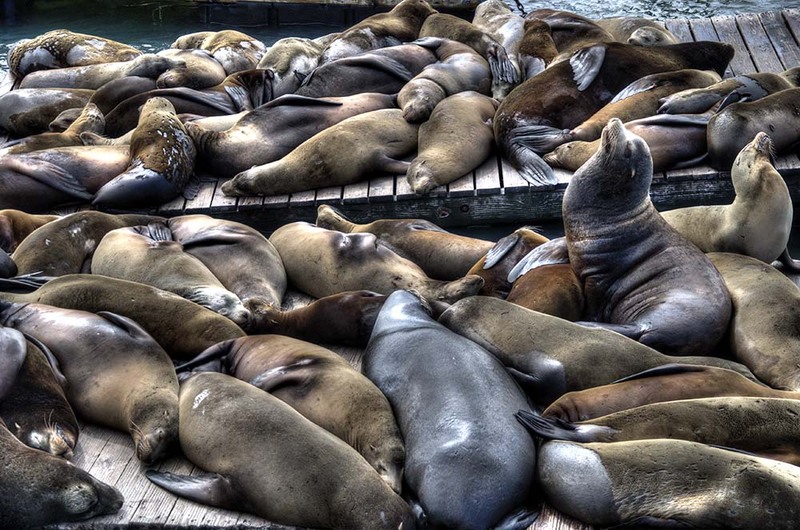 At Pier 39, there are shops, restaurants, a video arcade, street performances, an interpretive center for the Marine Mammal Center, the Aquarium of the Bay, virtual 3D rides, and views of California sea lions hauled out on docks on Pier 39’s marina. The marina is also home to the floatingForbes Island restaurant. A two-story carousel is one of the pier’s more dominant features, although it is not directly visible from the street and sits towards the end of the pier. The family-oriented entertainment and presence of marine mammals make this a popular tourist location for families with kids. The pier is located at the edge of the Fisherman’s Wharf district and is close to North Beach, Chinatown, and the Embarcadero. The area is easily accessible via the historic F Market streetcars. From the pier one can see Angel Island, Alcatraz, the Golden Gate Bridge, and the Bay Bridge. Blue & Gold Fleet’s bay cruises leave from Pier 39. Pier 39 was first developed by entrepreneur Warren Simmons and opened October 4, 1978.